The action-filled, epic conclusion to the Death in the Treklant Trilogy. You have raised the ire of the goblin warlord, and you must flee the kingdom with this armies hot on your trail. 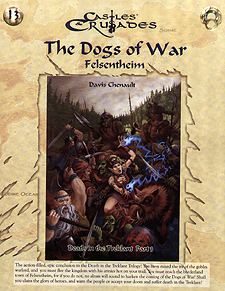 You must reach the borderland town of Felsentheim, for if you do not, no alarm will sound to harken the coming of the Dogs of War. Shall you claim the glory of heroes, and warn the people or accept your doom and suffer death in the Treklant?